What good is more horsepower if it isn�?_t transferred to the ground? The clutch is the main link between the power your engine produces and the transmission, but all too often it is also the weak link. Many stock clutches simply will not last under harsh driving conditions or continual hard launches. When a car is making more horsepower than stock the factory clutch is under even more strain. This can cause premature clutch wear and costly repair bills. Spec Clutch solves this problem with their line of performance clutches. 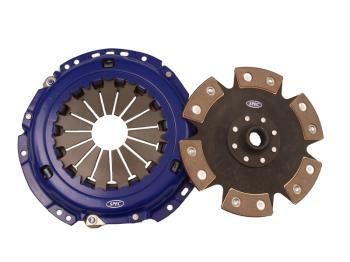 With increased surface area Spec clutches give your transmission more �?_bite�?_ while increasing reliability and performance. Includes bearing and tool kit. (application dependent) This clutch application ends production date 1/01. 96-98 and 00-04 GT models take flywheel part numbers SF64S/SF64A. 99 GT models take flywheel part numbers SF84S/SF84A. Please type the correct part number or ySpec production date in the notes section of the order form.